What’s going to keep your organization one step ahead of the competition? How about always building better products or services faster than the other guy? No matter what industry you’re in, only a strong workforce can get you there. To get the most out of your employees, you need a way to keep your finger on the pulse of employee engagement. Stay informed on the natural ups and downs of employee sentiment, so you won’t be caught off guard by personnel issues that can throw your business off course. Mike Volpe, CMO of HubSpot, says it best. “TINYpulse helps you uncover and quickly fix problems that are small before they become big, troublesome nightmares” so you can focus on your business and being the best at what you do. A+ talent creates A+ companies. But with a competitive marketplace, how do you attract and retain the type of talent that’s going to drive the innovation that will feed your company’s success? With pulsing surveys, that’s how. Senior leaders are leveraging TINYpulse to prove they are committed to transparency, open communication, and collaborative workplaces, the types of environments that attract the employees who will push their company ahead of the competition. Just check out this video. Craig Cincotta, VP of Brand Communications at Porch, shares how TINYpulse has helped his company. With nearly 50% year-to-year employee growth, Porch needed a way to show their commitment to empowering employees and driving collaboration. With all the money and time invested in finding those A+ players, pulse surveys will ensure that you’re giving them the environment they need to thrive. Engagement, productivity, and customer service are 14% better in organizations where recognition occurs. 69% of employees said they’d work harder if they felt their efforts were better appreciated. 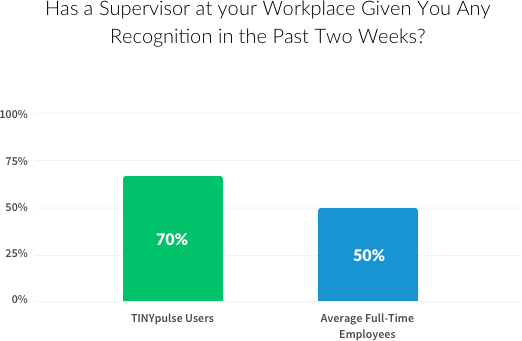 Thankfully, when organizations use pulsing surveys like TINYpulse, their teams report enjoying 40% more recognition than employees at those “other” organizations. Thanks to Cheers for Peers, our built-in peer-to-peer recognition tool, it’s easy for supervisors and peers to give colleagues a high five for a job well done. We help bring recognition to the forefront of a manager’s feedback. Not because we encourage empty praise, but rather because we know little things like saying “thanks” can slip one’s mind. But with all the great things recognition is tied to, can you really afford to forget about it? Imagine having offices spread across the country — or perhaps across multiple countries. How do you align a team around so many cultures? How do you keep them engaged and wanting to work together? And more importantly, how do you prevent fiefdoms? But pulsing surveys have solved some of those challenges. 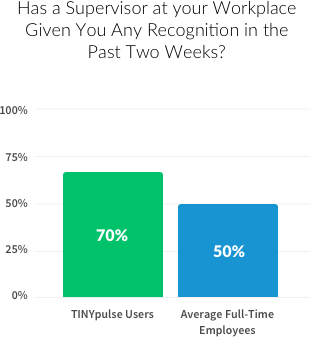 “TINYpulse has had a profound impact on our organization. It’s taught people to speak up when they’re unsure, and not be afraid to speak up.” In short, TINYpulse has helped unite their regional offices to create a universal culture of collaboration and communication.